I‘ve flown a total of eight sectors with Air France over the last few months for business and pleasure in economy, business and premium economy. My first experience was a return trip between Dublin and Zurich (via Paris) as part of a business trip, and the second experience was a long haul trip to meet up with family in Bali, so I flew from Paris to Singapore in premium economy. 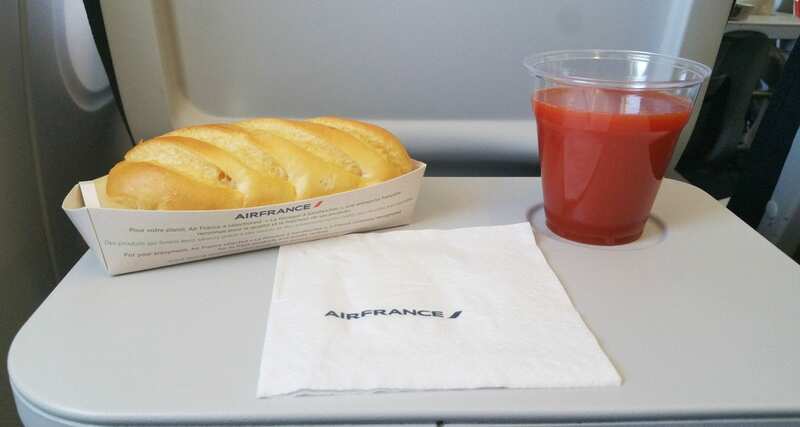 Air France offer free meals and drinks on all flights, and as you will find out below, you can even upgrade your meal in economy and premium economy class for a fee. Enjoy! It’s getting harder and harder these days to score a free snack and a drink when flying across Europe Air France still offer free drinks and snacks on their European flights. 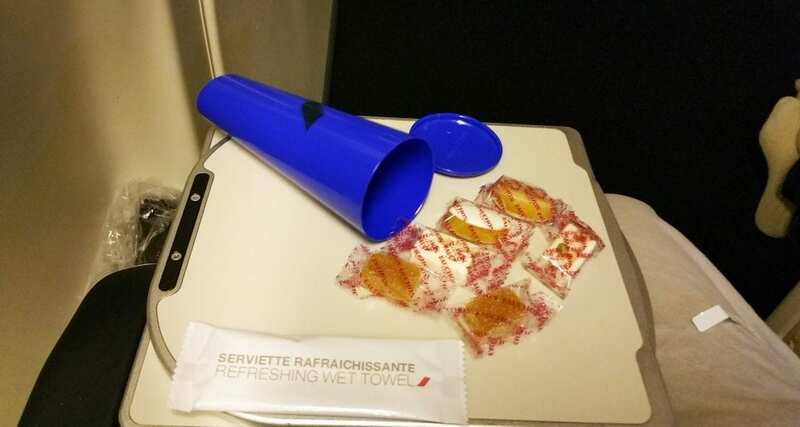 This offering was served on a flight from Paris to Zurich, which has a flight time of around 55 mins. Not bad at all for a short hop in economy class, a Le Kiosque Emmental Cheese baguette served on a delicious brioche roll. My flight from Paris to Dublin (Operated by CityJet) was oversold, and I was upgraded to business class, bonus! On this flight of just over 1.5 hours, you can expect to be served something similar to this, depending on the time of day of course — grilled meat and vegetables, blue cheese and a raspberry cake for dessert. 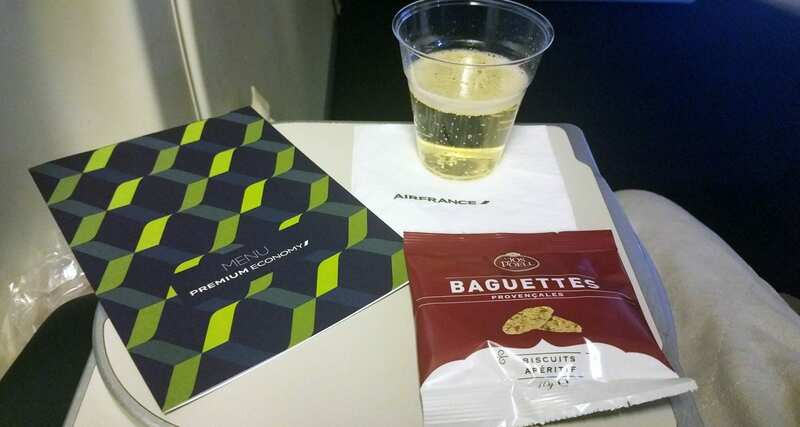 PAID UPGRADE MEAL – PARIS TO SINGAPORE AF256. So in addition to the above trip, I booked a personal journey to head to Bali to see family, I decided to fly premium economy with Air France from Dublin to Singapore via Paris. 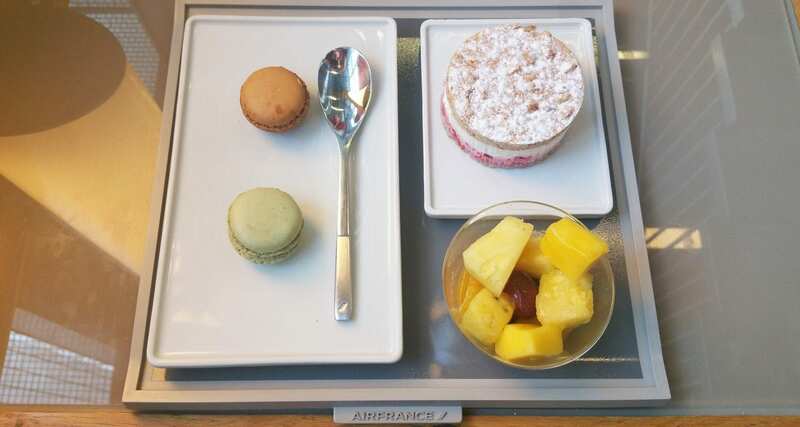 I’ve wanted to fly Air France long haul for a very long time to sample the upgrade meals that you can purchase. 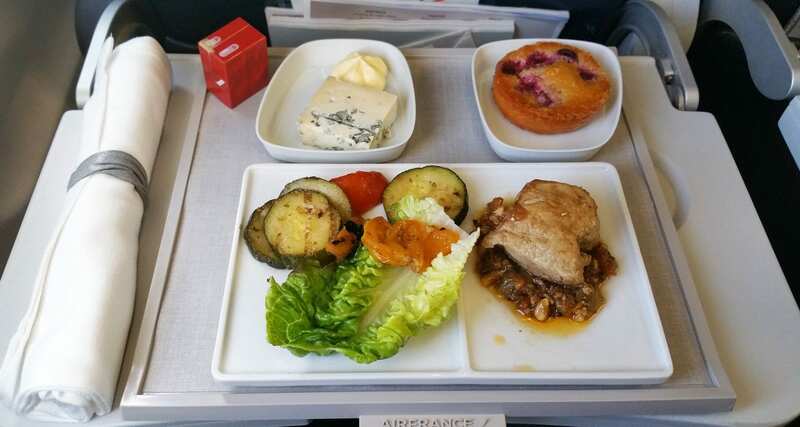 In case you’re not aware passengers in Economy and Premium Economy on select flights ex Paris can pay to upgrade their main meal and receive something that’s more like a business class meal. 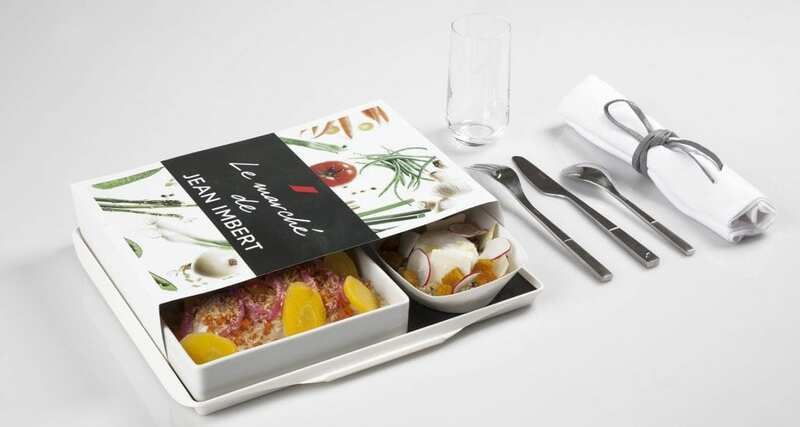 You can pre-order up to 24 hours prior to departure and choose from five options including a meal created by France Top Chef winner Jean Imbert, A meal designed by the famed LENÔTRE, a traditional menu, an ocean menu or the Italia menu, meals start at €12.00, and you can even pay by frequent flyer miles. The meal that I selected for my flight from Paris to Singapore was the LENÔTRE which cost me €28.00, and I feel it was more than worth it. Entree: Salmon pannacotta. Main: Viennese chicken with piquillo chilli pepper, mashed potatoes, carrots and lemon. Dessert: Cheese (of course) and a Concerto from LENÔTRE, layers of chocolate flavours; mousse, biscuit, ganache, and chocolate crisp. 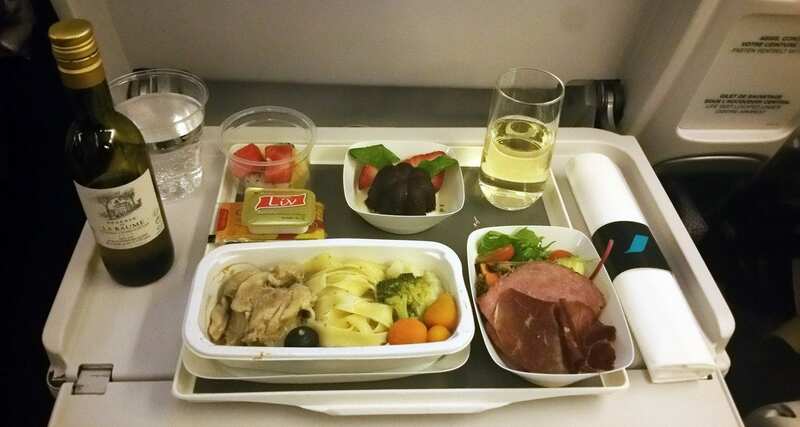 The cabin crew delivered the meal to me first much like a special meal order, and my seat neighbour was interested to find out how I managed to score such a meal. It’s a meal that could easily pass as a business class meal and while the presentation of the main meal doesn’t look so appealing here, let me tell you it was delicious! The best part? The layered chocolate cake reminded me of an experience at Pâtisserie Sadaharu AOKI Paris, amazing. 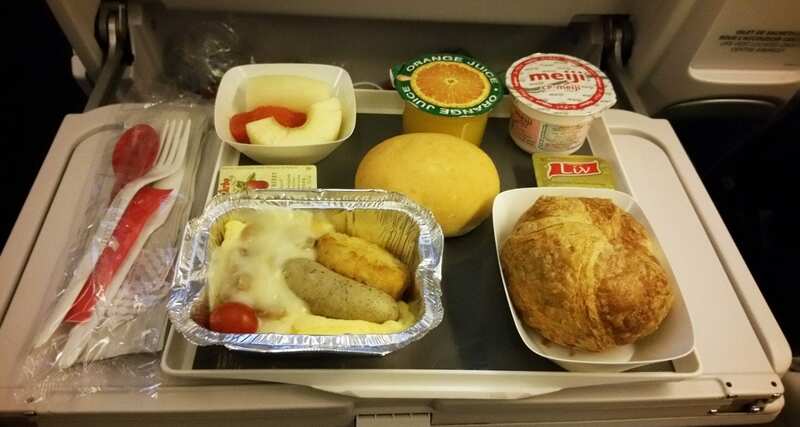 Two hours before landing in Singapore the cabin crew delivered this breakfast option to everyone, probably a little on the small size for premium economy I thought. Main: Eggs with spinach. Sides: Brioche bun, yoghurt, fruit puree and orange juice. PREMIUM ECONOMY CLASS – SINGAPORE TO PARIS AF 257. 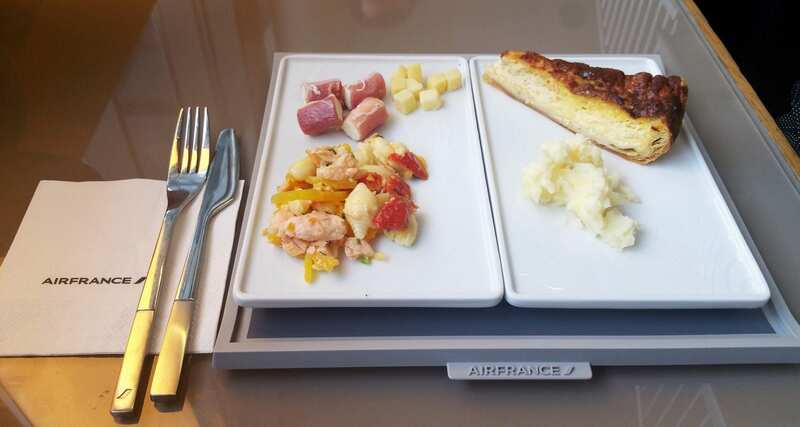 You can only upgrade your meals when flying from Paris as the airline probably wants to be able to control the quality of the paid pre-order meals. So on the way back to Paris, I was able to get a closer look at the main meals offered. Entree: Pastrami salad. Main: Braised chicken with fettuccine and vegetables. Dessert: Mint chocolate mousse and fruit. Quite impressed with this tray offering, there’s a lot of food and real glassware too. I wasn’t a big fan of the braised chicken, but the fettuccine and vegetables were perfect, moist and not overcooked at all. Again two hours before landing the cabin crew served breakfast. Main: Eggs, sausage, hash brown and tomato. Sides: Fresh fruit, orange juice, yoghurt, bread roll and croissant. 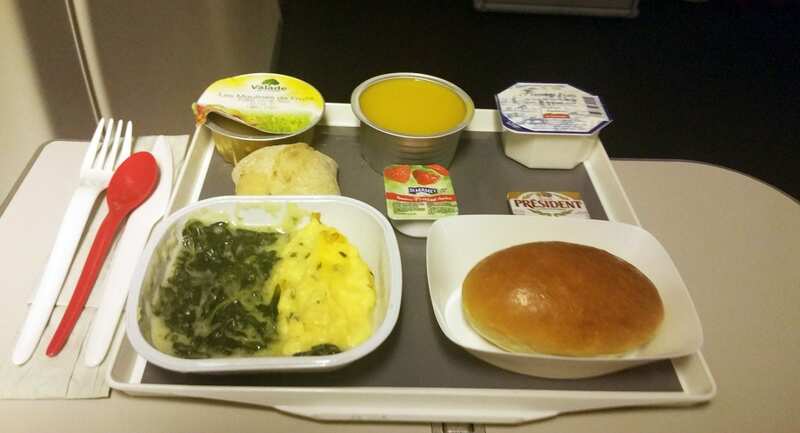 Quick disclaimer: The airline knew I was flying from Paris to Singapore to sample their pre-order meals, I paid for my flight ticket in premium economy class and paid for my meal I did not receive any upgrades. 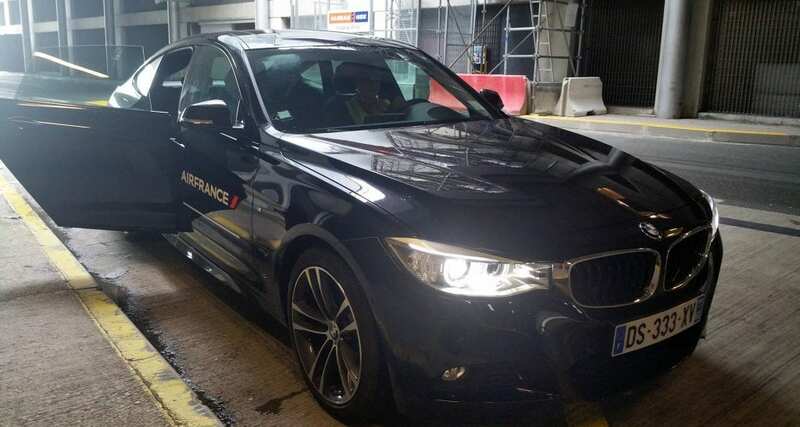 The only special treatment given was a chauffeur BMW service at Paris airport to see how first class guests are treated when in transit at Paris CDG airport. I already had access to their lounge due to frequent flyer status.